Yes, once again I have to report that my attempts to master paste-resist dyeing have failed … I really do think that the paste was better this time – it was a lot thicker, so I could use it with a stencil – however, it seems I’m still using the wrong kind of dye. This time I tried spraying the dye onto the fabric when it was laid out flat on the floor, so that it wouldn’t dislodge the paste the way it did when I submerged the fabric. But it just soaked around the paste anyway, and in fact, as I didn’t use all the dye, it didn’t even really make much difference to the colour. So if anyone reading this can suggest a thick dye medium which I could use to sponge onto the surface of the fabric, do let me know! PS I would post up a picture of the fabric as it looks now, but really, given that the pattern is almost indiscernible, there is no point. I know, impressive, huh? 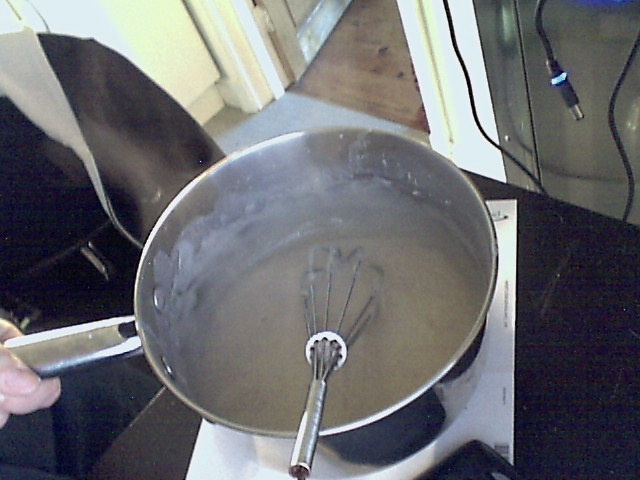 The important thing seems to be the ratio between pot size and quantity of paste – I’m using the same saucepan, on the same hob, as before, but this time I’m only making half the amount, and that seems to be doing the trick. I think if it works this time, I might make a video of the whole process and put it on YouTube, because this is really the kind of thing where you need someone to show you what to do, and there don’t seem to be any other videos out there. Anyway, I’m going to keep boiling, stirring, and hoping, and I’ll post the results here sometime soon. Wish me luck! Here are some photos of the paste resist patterns, before the dye washed them all out! After a whole day spent carefully painting a waterlily design onto the pattern pieces for the dress I was going to make, I put it into the dye, being careful not to stir and disturb the paste, and … it just dyed the whole thing. Except for a few patches of lighter colour, which render the fabric useless for anything else. So, the result of all those hours of research, paste-boiling, and painting? Some blotchy blue fabric and stained fingers. EPIC FAIL. At least I have some photos of the pretty design before I ruined it with dye. Next time I’ll use wax, or get someone who knows what they’re doing to show me how. So tonight I thought I’d try paste-resist dyeing, which is a technique used in traditional Japanese fabric design; it’s a bit like batik, in that you block out areas of cloth in a negative design and then dye the fabric. Instead of wax, though, you use a paste – in Japan I think they use rice flour, but I found this recipe by Irena Boobyer on the Exeter University website, which uses plain flour and caustic soda. Unfortunately, what they didn’t mention at the ‘simmer until the liquid becomes transparent’ stage is that this part takes ^hours^. At the moment it’s 11.20 at night and I’m still waiting for it to go clear. Hopefully, though, tomorrow I’ll be able to paint on the design and make some lovely fabric for a summer dress (just in case the sun ever comes back).